Could anything be more exciting on a gray, wintry day than to take part in sampling thousands of the country’s best wines at the San Francisco Chronicle Wine Competition Public Tasting? You can swirl, sip, compare, and celebrate the relationship between varietals and victuals. In partnership with gourmet food website SavorCalifornia.com, the event offers delicious hand-crafted creations from premier artisan food purveyors. Fare includes award winning artisan breads, savory meats, exotic oils, hand crafted cheeses, delicious desserts, floral jams, sumptuous sauces, and other fabulous creations by the California Culinary Academy. 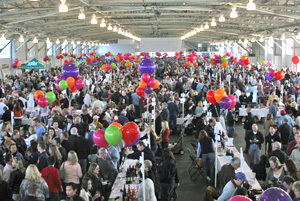 The SFCWC event will be held at Fort Mason Center’s Festival Pavilion in San Francisco, Saturday, February 28th, 2009. Recognized as the largest competition of American wines in the world, the SFCWC invites every taste, from consumers to connoisseurs, to taste America’s finest. The Competition broke world records in 2007 with 3,800 American wine entries, a number that established its position as the largest competition of American wines in the world. The 2008 competition raised the bar even higher, featuring an astounding 4,235 entries. This year, the SFCWC proudly welcomed a total of over 4,736 wines from 1,212 winery brands, submitted from 300 wineries in 26 states throughout the country. Admittance, if still available the day of the Tasting, is $80 at the door.